The RapidSOS Emergency API reduces the complexity of getting lifesaving data from connected devices to public safety. With millions of connected devices all built for different purposes, emergency call flow needs won't always look the same for each customer. That's why we built the RapidSOS Emergency API — to easily allow for various customizable call flows between connected device users, emergency contacts, emergency services and related third parties. The interface to customize your call flow for your customers' needs is the RapidSOS Emergency Console. What is the RapidSOS Emergency Console? Call flows can vary based on desired solutions. Where one app/device may simply offer a direct connection between the caller and 9-1-1, another app/device may have a need for a complex flow including multiple callers, call trees, Ops Centers, SMS messaging, and more. The RapidSOS Emergency Console makes it easy for Engineers, Product Managers, and even non-technical business folks to customize their call flows for their needs. 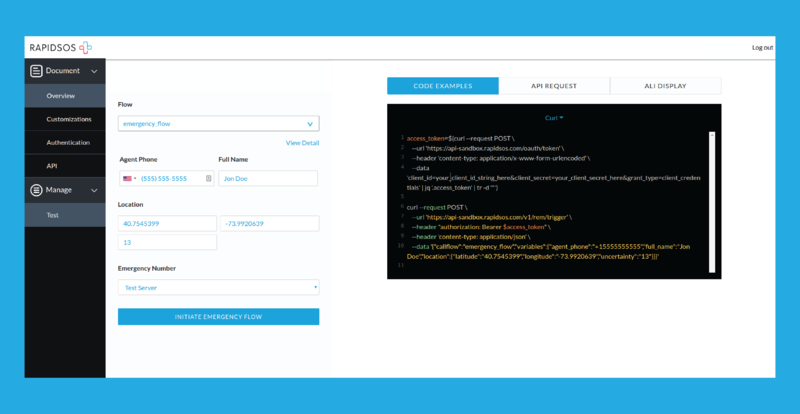 How does the Emergency API fit into the RapidSOS platform? Want to stay up to date on all things RapidSOS? Sign up for our email list.